Feral Interactive today released Sid Meier's Railroads! on the Mac. The game is the most recent release in the much beloved Railroad Tycoon series, the first of which was released in 1990. 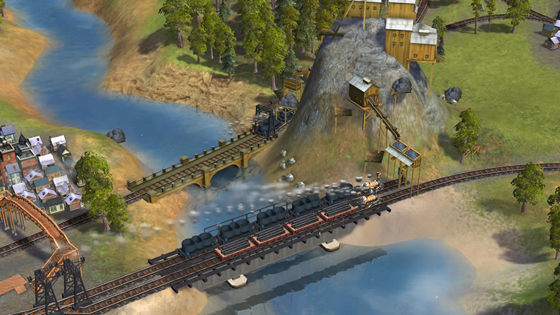 Railroads was originally released for the PC in 2006, but this is its first appearance on the Mac. Build a railroad empire and shape a nation! Lay track, route trains and watch the world come to life in this compelling mix of train set and business simulator. Become the ultimate railroad robber baron with the drive to shape a nation, build an empire and amass a fortune. Spanning the history of the railroads from the steam engines of the 1830s to the bullet trains of today, Sid Meier’s Railroads! for Mac is a bold re-imagining of the legendary Railroad Tycoon (1990), the game that launched the “tycoon” genre. The game has very generous system requirements, asking for at least a 1.8GHz Intel processor running OS X 10.6.8, 3GB of RAM, and a 128MB graphics card. Sid Meier's Railroads! is available for $30 from Feral's online store, and will soon be available on the Mac App Store as well. Really don't understand trailers that show zero gameplay. I've noted a fair amount of complaining about the price of the game in this thread. People don't seem to realize that it costs a lot of money to produce and carefully test a high quality native port to OS X of a game. You cannot compare the price of this to an existing windows version that is six years old. This game is newly ported and it cost a lot of money to do that. Please don't underestimate software engineering tasks you probably aren't qualified to evaluate. I see a lot of that in gaming forums as well. People often believe it is a trivial affair to port a game. It isn't. It isn't trivial to properly test it on a variety of machines, configurations and operating system releases either. All that costs money. Last but certainly not least, Feral Interactive is a business, not a charity - they need to make a decent profit to bring us high quality releases for OS X, otherwise it simply is not worth doing. They've got bills to pay just like the rest of us. Short version: There is no free lunch. Ports cost more money, particularly of the quality Feral is known for. Is 3 gig of RAM for a six year old game really considered a modest system requirement? Mountain Lion is subsidised by hardware sales. Why does everyone expect everything for nothing nowadays? I'd prefer the trailer showed some actual gameplay instead of an animation of some guy. Because we're too used to being spoon fed instead of working hard. I am just saying that pricing higher than other games on steam for a 6 year old game is asking to be pirated. Not really complaining about the set price much. Talking about the general population of the modernised world. WARNING: This is a long post answering all the questions I have seen so far! Anyone know if this is an EXACT port of the '06 Windows version? I already have that one via Steam on my Mac, running in Parallels. We added all the DLC packs and fixed a bunch of multiplayer and scenario editor bugs. On the PC making custom scenarios sometimes caused them to be unplayable we fixed all that. We also upgraded the audio tracks from low bit rate mono to high bit rate stereo. If you have a nice set of headphones/speakers you should really notice the difference. There are a few other fixes dotted about but those are the major changes. I loved this series but this version (on the PC at least) was the biggest piece of crap ever because of constant crashing out when things got busy ! Other than that the game was awesome. We fixed a bunch of crashes in the PC version for the Mac. Not claiming it's crash free but it should be much better when things get busy. Can you install it on multiple machines? That is one of my understandings of the benefits of waiting for Steam or Mac App Store. Although as I understand with Steam you can only play on one machine at a time, whereas the Mac App Store doesn't care. Or do misunderstand how that works. Our system allow you to install on as many Mac's as you like (you have a limit of 5 Mac's being activated at once). You can deactivate and reactivate as many times as you want. Once activated we don't phone home or demand an internet connection you can play offline to your hearts content. It's not so much the game as the OS. The OS these days uses up so much RAM before the game even loads, that's why we need to take this into account when coming up with the spec. You imply that it is carefully tested !! Ha ha, that's a good one !! Also porting is not that expensive when considering the whole process. Large portions of the code can be recompiled with little change, no new audio is needed, little in the way of artwork Is needed. It still costs a lot of money sure, they are a business too but compare the cost to some iOS games of equivalent complexity that are not ports, someone is either overcharging or undercharging. You then have licensing costs as some libraries will need to be licensed per platform. In fact in this case (Railroads) the PC music had to be replaced so we needed to re-record all the music in the game (we updated it to high bit-rate stereo from low bit rate mono). We also fixed a number of crashes from the PC which many people noted when the PC game was released. I understand your comments, I made similar ones before I joined a Mac company and saw how it works from the inside. The good thing is with more Mac users playing games the choice of games is increasing the their are more flash sales etc where you can get a bargain. I hope this explains a bit about the realities you face when porting a title, it's not a case of recompiling the code and charging a fee. It's months of work, licensing and testing to get a high quality port completed.